Everything you need to know about this weekend’s mobilizations against climate change. 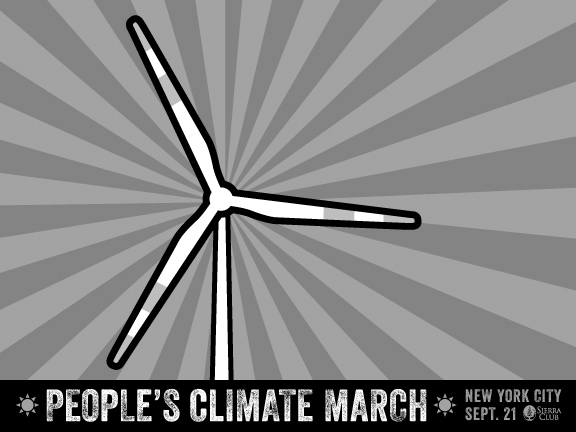 When/Where/What is the People’s Climate March? Tomorrow’s People’s Climate March is being billed by organizers as the largest march against climate change in US history, with a predicted turnout of 100,000 people. Activists will assemble on Central Park West from 61st St. to 86th St. for the permitted march, which begins at 11:30 am. Aside from the fact that in the next few decades scientists estimate millions are going to die from disease, natural disasters, overheating, and carbon emission pollution, the People’s Climate March is intended to pressure world leaders ahead of the United Nations (UN) climate summit on September 23. Don’t expect a Battle of Seattle-style showdown, though. The march has been carefully coordinated with the New York Police Department and, occurring two days before the actual summit, there’s little possibility for serious disruption. Even UN General Secretary Ban Ki-moon announced his intention to join the march. The march and numerous actions later in the week were planned by The Climate Group, a prominent international nonprofit, in collaboration with numerous environmental groups and over fifty unions. SEIU 1199, 32BJ, District Council 37, TWU 100, and the IBEW 3 are some of the New York locals sponsoring the march. According to 350.org spokespeople, funding for the march’s massive subway ad campaign came from “small member donations to Avaaz.org.” Climate Week NYC, in contrast, was backed by a myriad corporate sponsors, including platinum sponsor Lockheed Martin, gold sponsor BMW, and “clean revolution partners” like IKEA and the World Bank. In a statement to Jacobin, organizers from the People’s Climate March claimed they had no official partnership with Climate Week NYC and did not receive any corporate funding. Where do I find my comrades? The Free Palestine Contingent will meet at 10 am at the northeast corner of 78th St. and Central Park West. 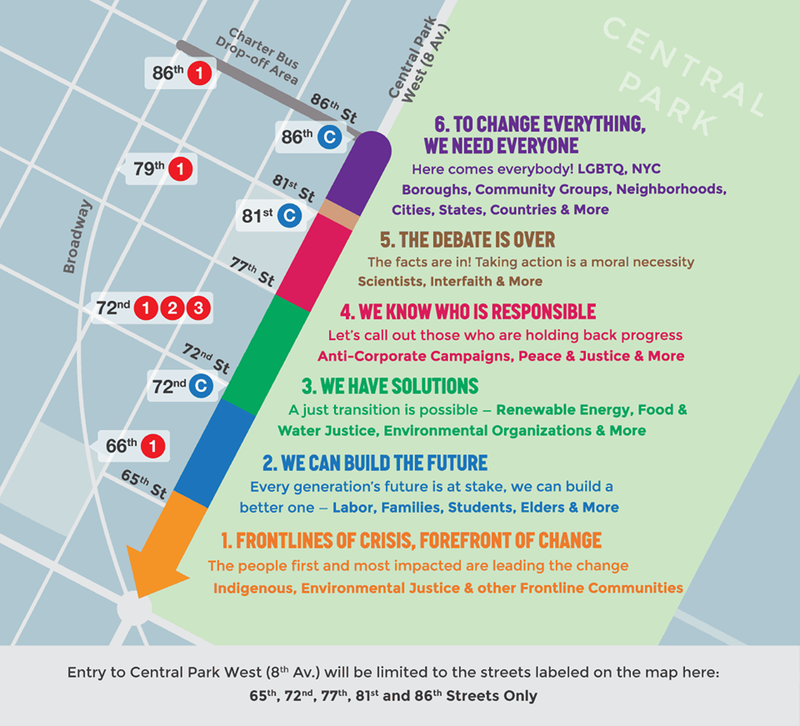 The People’s Climate March has also scheduled a labor bloc to meet between 66th and 72nd St. and an indigenous people’s contingent at the front of the march between 61st and 65th St.
System Change Not Climate Change, an ecosocialist bloc, will assemble at 10 am between 79th and 80th St. The Anti-Capitalist Bloc of the People’s Climate March, organized by Black Rose but open to all anti-capitalist activists, will meet at 11 AM on 90th St. Look for the red and black flags. Will there be any direct actions during Climate Week NYC? While the People’s Climate March is going to be a massive walk through midtown, a less advertised direct action event, #FloodWallStreet, will begin at 9:30 am the next day in Battery Park. Naomi Klein, Chris Hedges, and Rebecca Solnit will kick off the event, after a performance by the Rude Mechanicals. At 11 am there will be a nonviolent direct action training, after which activists, wearing blue, will attempt a mass sit-in on Wall Street. Commentators in both liberal and leftist circles have critiqued “The People’s Climate March” for its refusal to make specific demands on businesses and governments.